Darigold donates a boatload (or actually we should say “untold truckloads”) of product every year. In many cases, these are related to our priority of addressing hunger relief or raising awareness and celebrating healthy diets and lifestyles. Often donations are part of an event or campaign that Darigold is sponsoring. What is particularly fun about product donations is that they most often involve much more than a truck dropping pallets off at a recipient’s loading dock. Instead, you’ll see Darigold employees personally handing out RE:FUEL to runners as they cross the finish line, passing out chocolate milk to trick-or-treaters, gifting product to tailgaters at charity football events, staffing tents at local fairs, handing out chocolate milk to attendees at the Farmers’ Day Parade, and delivering butter for a pancake breakfast fundraiser. Each plant has sponsored events, give-away campaigns and volunteer activities relevant to the specific culture and characteristics of their communities. The illustrations below just touch the surface of how Darigold consistently shows up in our communities around the northwest. The Young Cooperator (YC) Program was established in the early 1950s through the National Milk Producers Federation (NMPF) as an organization for young dairy farmers. Supplementing the 4-H and FFA youth program, the YC Program continues education and leadership opportunities. Northwest Dairy Association Young Cooperators is an organization made up of co-op members (individuals and couples) from the ages of 19 to 45 who are currently members of Northwest Dairy Association. The purpose of the program is to educate and build future co-op leaders and to gain a better understanding of how dairy cooperatives work with NMPF in developing national dairy policy. The program also provides its young members with the information and knowledge they need to better understand milk marketing and the cooperative’s operation and structure. 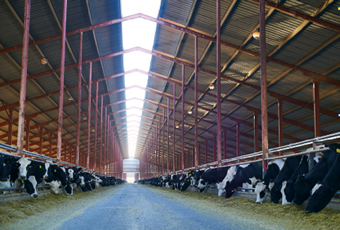 To develop a better understanding of how dairy cooperatives work with NMPF in developing national dairy policy. In 2013, Darigold producer Bill Wavrin and other dairy farmers in the region teamed up to fund and launch a program to distribute Darigold’s 2% milk to people and families in need in their community. 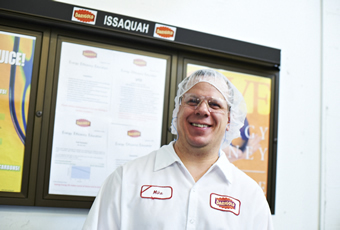 The producers partnered with non-profit Second Harvest to distribute the milk to food banks and meal programs in the mid-Columbia Valley (WA) basin. 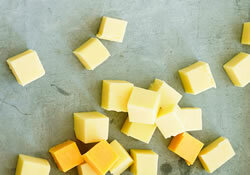 Second Harvest has the necessary logistics expertise, along with the required cold chain infrastructure and refrigerated warehousing needed for perishable milk products. More details and a video about Dairy for Life are available on the Second Harvest website. “In 2012, 2013 and 2015, we joined with Town and Country stores to support a couple of MSU football games in a tailgate event. 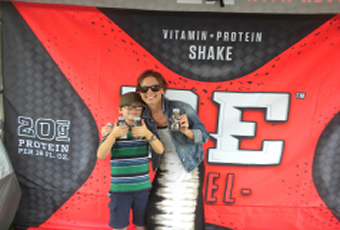 We passed out RE:FUEL to the attendees. This involves 4 to 6 volunteers from the plant. You are going to wonder why I am sending a picture of the Pepsi Salesman. His name is Brandon. 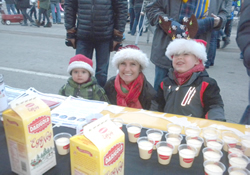 Each season, you’ll find the public dropping by Darigold’s tent to sample eggnog while learning about Thrive’s programs to help families raise healthy, successful children. 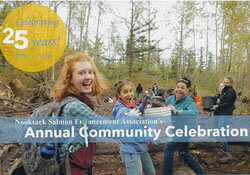 Darigold has participated as the “Ofishal Spawnsor” of the popular two-day Issaquah Salmon Days Festival. 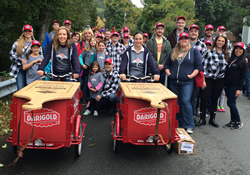 For several years, Darigold employees and their families have shown up in force at this iconic Pacific Northwest festival to help the hundreds of thousand attendees celebrate the return of the salmon to local waters. 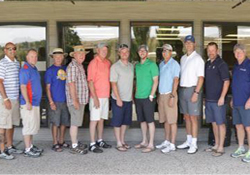 Darigold Promise Invitational Golf Tournament raises funds for kids with cancer. In 2016, Darigold’s Jerome plant donated $21,695 to Boise’s Got Faith, 100% of which goes directly to provide financial and emotional support to children fighting cancer. 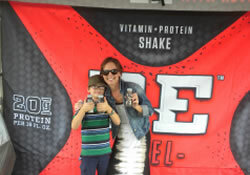 Darigold donated 5 cases (60 cans) of our Darigold Whipped Cream topping for this event. Darigold employees volunteer at this significant community event. The Darigold Portland plant puts donation boxes in the plant entrance and people bring gifts in. 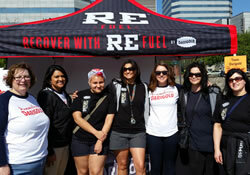 Darigold employees volunteer in support of the walk to create a world free of multiple sclerosis. In 2016, the Portland event raised $349,583 to fund critical services and research. Darigold is one of the sponsors of the non-profit Portland’s Singing Christmas Tree event, a tradition bringing together over 300 adult and youth choirs, dancers, local actors and a live orchestra. Darigold’s 2016 contribution is $5,000. 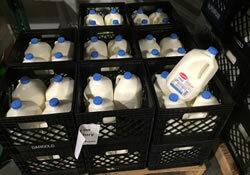 Darigold donates two pallets of milk per week to Northwest Harvest, which amounts to 25,000 gallons of milk annually. The milk is distributed to nearly 4,000 families and more than 12,000 children each month through Northwest Harvest’s food banks in Seattle, Georgetown, Lake City, Rainier Valley and Wallingford. 2016 is our third year of donation. But perhaps even more than that, Darigold is using the power of its brand to raise awareness about the need to fight hunger and encourage community members to donate as well. The “Fun Fridge” promotion at Fremont’s Sunday Market in September 2013 is a good example. The public is invited to help fill refrigerators for donation to Northwest Harvest. Darigold stepped up to the plate (excuse the pun) and joined in supporting Northwest Farmers Fighting Hunger by offering 100 gallons of milk for every run the Seattle Mariners scored against the St. Louis Cardinals during their June 25th game at Safeco Field to benefit Food Lifeline. The Mariners scored five runs that evening and beat the Cards 5 to 3 – and the Food Lifeline had 500 more gallons of milk to help the hungry! Darigold delivered 500 gallons of fresh 2% milk to the new Food Lifeline hunger solutions center in south Seattle. Darigold producers and employees show up for Sunnyside’s signature Lighted Implement Parade 2012-2015, joining other community members and visitors in celebrating Sunnyside’s agricultural heritage past, present and future. 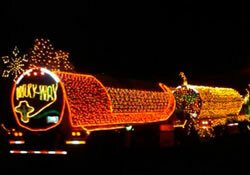 The image shows LTI’s lighted Milky-Way milk truck, which won second prize in 2012. We donated cheese to the Sunnyside and Mabton Police Departments for this August 2016 event. 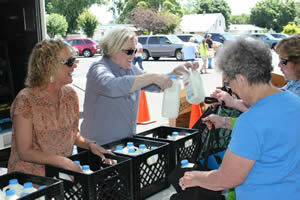 Darigold has donated milk and cheese to community fairs and festivals in the Yakima Valley area. 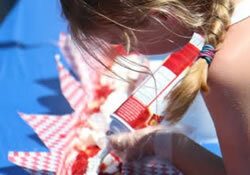 Examples include the “Rage in the Duathalon,” high school car show, and 4-H activities.